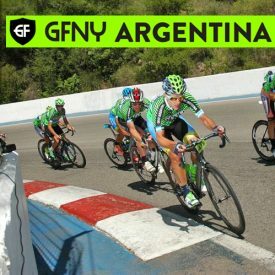 NEW YORK CITY, November 1, 2016 – GFNY, the Global Cycling Marathon Series, opened the racing season in South America with the second annual GFNY Argentina on October 30, 2016. Riders competed on an undulating, fully closed-to-cars 125km course with a mountain-top finish on the legendary Mirador del Potrero. Held in San Luis, the Argentinean province renowned for the professional races Tour de San Luis and Tour Feminino de San Luis, the GFNY Argentina course covered many of the same roads as the pro races. Despite the challenging economic conditions in San Luis that have led to cancellations announced last month of Tour de San Luis and Tour Feminino de San Luis, and the closures of the pro men’s team, San Luis Somos Todos, and the women’s pro team, Xirayas, GFNY Argentina was held with resounding success. A record number of riders took on GFNY Argentina 2016 and they all enjoyed the same pro treatment from San Luis Police that World Tour teams received when they raced in San Luis. A lead group of 20 formed after only 10k of racing when the racers from the local pro team put on the pressure in the cross winds. Five riders made a break with 40k to go and it was up to Mirador del Potrero to make the final decision. Enzo Josue Moyano took the win in 3:04:10, averaging 39km/h for 120km with 1,750m of climbing. Carlos Velazquez from San Luis Somos Todos pro team took second, Alfredo Lucero third. Fiorella Malaspina dominated the women’s race, maintaining her lead from start to finish. She was the only woman who made the cut into the second group during the hectic opening kilometers in the cross winds. Her winning time was 3:19:07, beating Alicia Reynoso Pueyo by 10 minutes. Aldana Cetra rounded out the podium less than a minute back. While only few riders were in the hunt for the overall win, there were many aiming to finish among the top 10% of finishers in their category to qualify for a racer corral spot at the GFNY World Championship in NYC on May 21, 2017.